September 26, 2013 — Let me see if I can define PEZ without looking it up on Wikipedia. 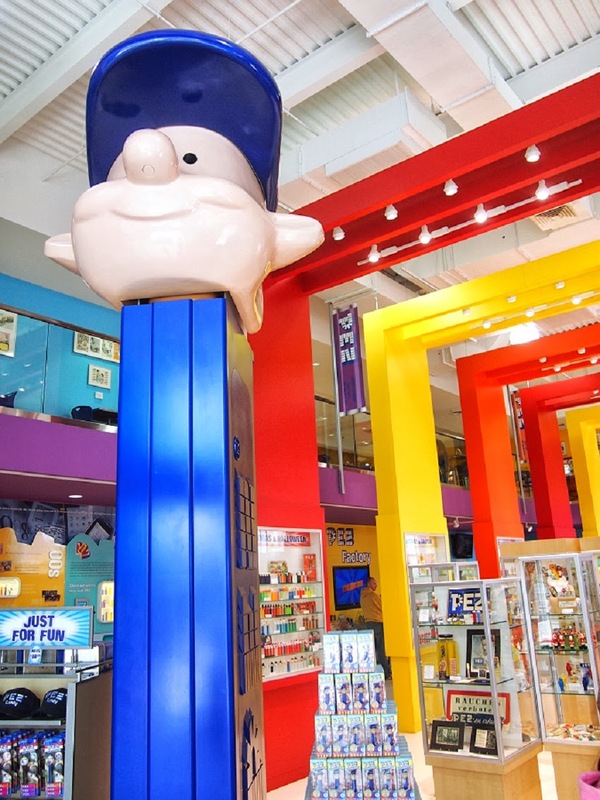 PEZ is a social engineering mechanism where children are rewarded with candy for decapitating pop culture characters. One day the training will be activated, and we will serial kill all the silly distractions of our culture so that we can evolve to a more awesome level of existence. 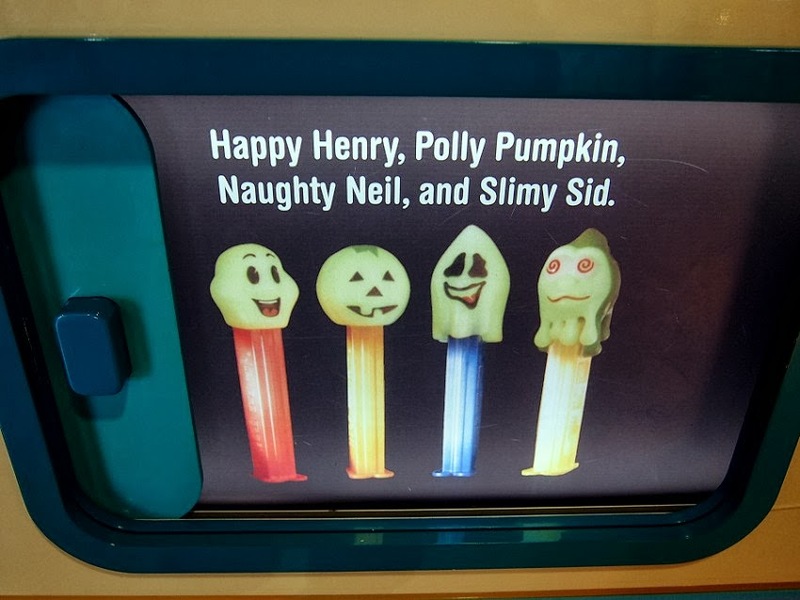 Or, it’s candy that comes with a plastic dispenser. 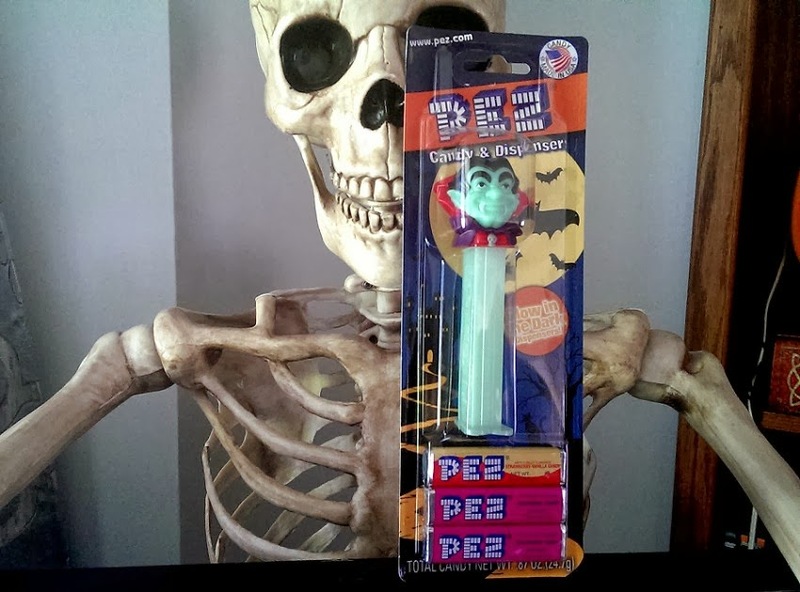 People love PEZ. I’m one of them, but not in the right way. I kind of hate the gimmick, love the candy. 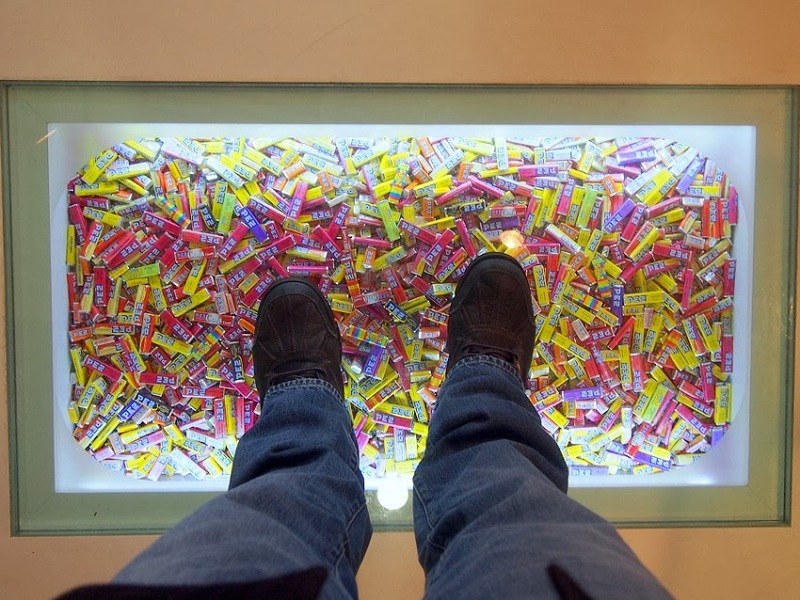 And I think I hate the gimmick because I love the candy. Seriously, it’s one of the best tasting and textured candies out there. But, because of the gimmick, it only comes in small packages and then you’ve got to shove them into the Donald Duck head to eat them only one tiny piece at a time. I would love the gimmick if it was more of a trough that I could shove my head into. But it’s time-tested. 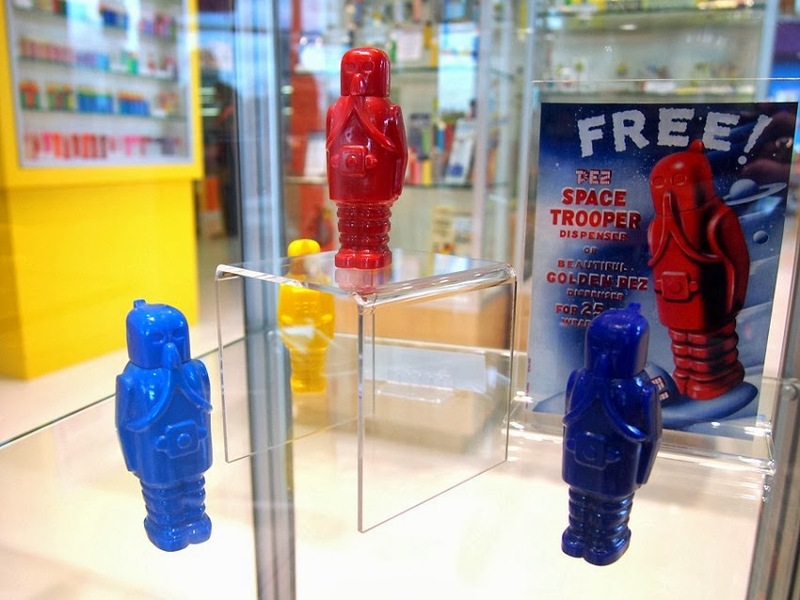 PEZ started in 1927 in Austria. The original flavor was peppermint, and the name was a cherry-pick of letters from the German word for the flavor, Pfefferminz. 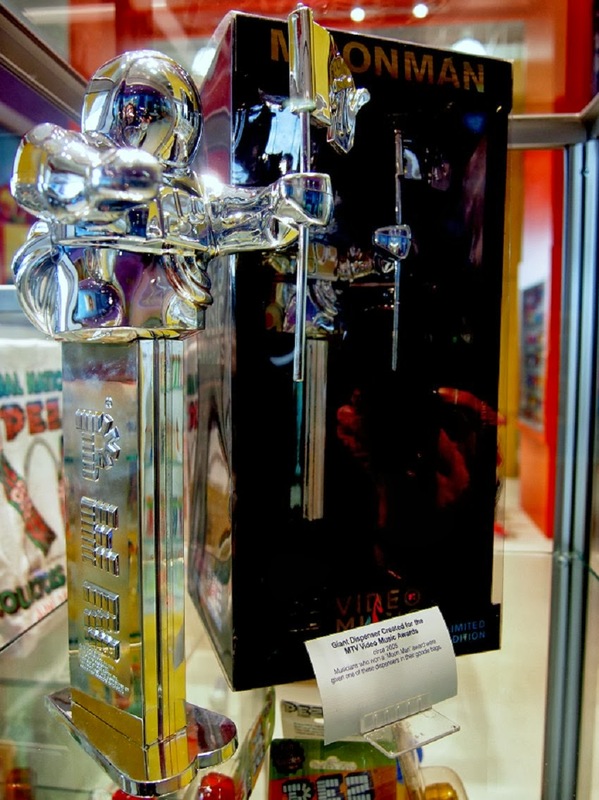 They were marketed as a way to replace smoking, and were eventually sold with cigarette lighter-shaped dispensers. And, of course, they still are that shape, just with Batman’s head on top. Anyway, because it is so loved and collected, PEZ created a visitor center at its headquarters and factory in Orange, Connecticut. 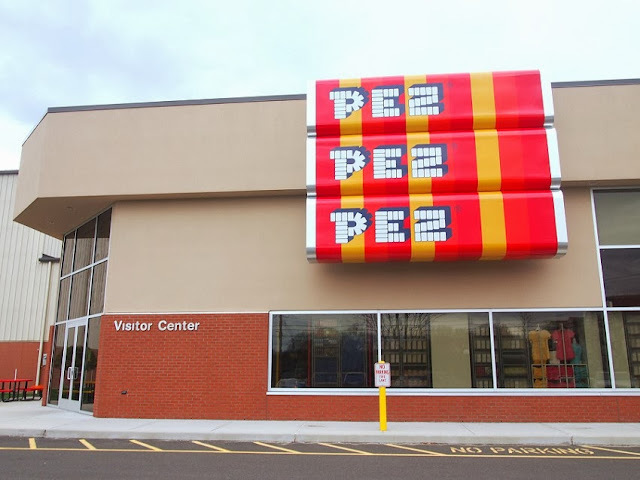 You’ll recognize the place because it has three enormous packs of PEZ decorating its façade. And a dispenser smokestack. All right, not really on that last, but it should. We entered the small lobby where you purchase entry tickets. 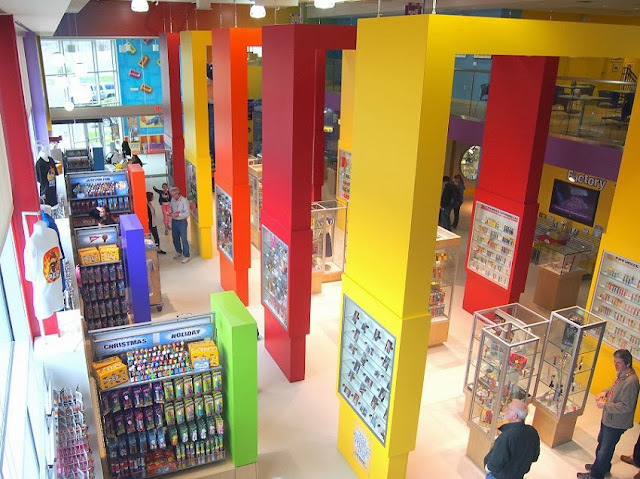 Its main feature is a massive wall of PEZ dispensers under glass, the type of wall I expect to see in the mansion of any millionaire worth his aires. You pay four or five bucks to get in, and half of that goes toward any purchase. It’s a pretty good deal because you’re going to buy something anyway, unless you're soulless...in which case a pack of PEZ will go a long way to fixing that for you. 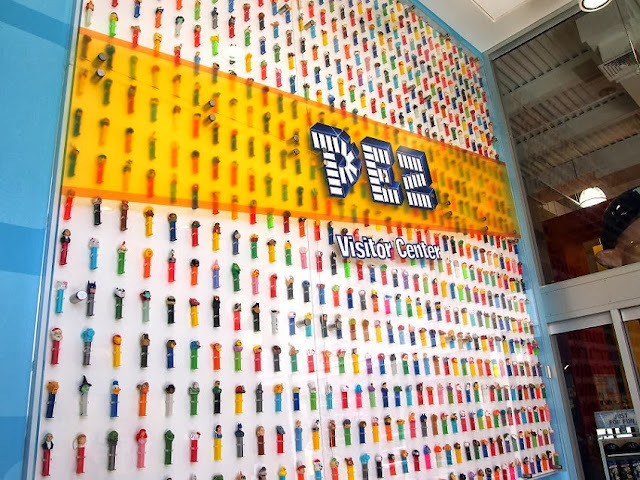 The first thing you see upon entering the visitor center itself is a two-story-tall blue PEZ dispenser with a cartoon baseball player’s head slowly nodding as it opens and shuts, waiting for the candy it was never made for. 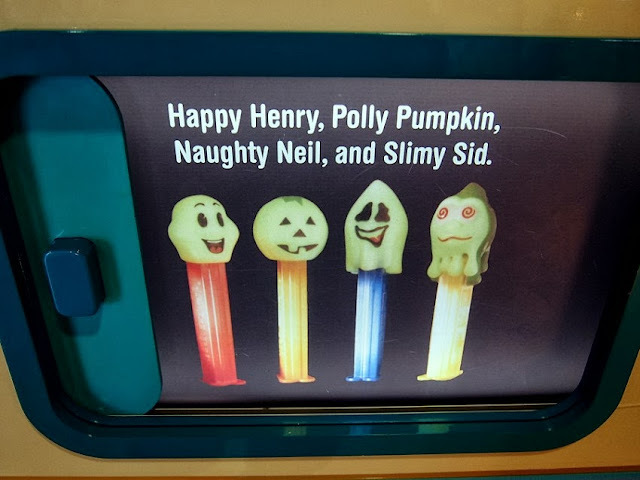 It makes sense that they would have something like that for a centerpiece, although I’m curious who chose “blobby guy in a baseball cap” to really wow visitors. The place isn’t too big, but it’s got a lot to see. 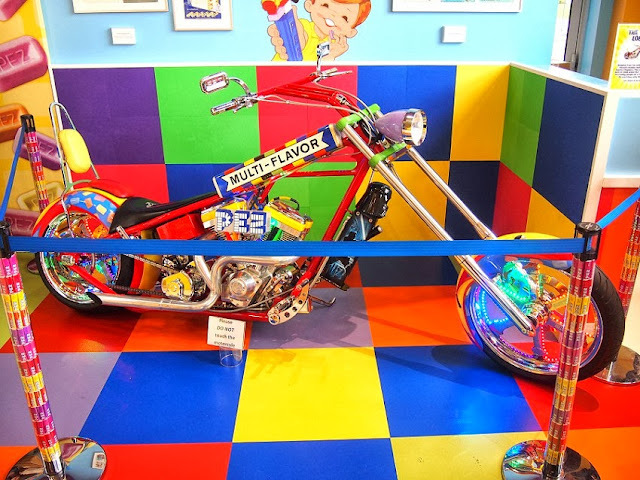 All kinds of PEZ dispensers were on display, of course, old ones, custom-ones, licensed ones, all in display cases throughout the room, as well as some other stuff, like a PEZ-styled motorcycle. 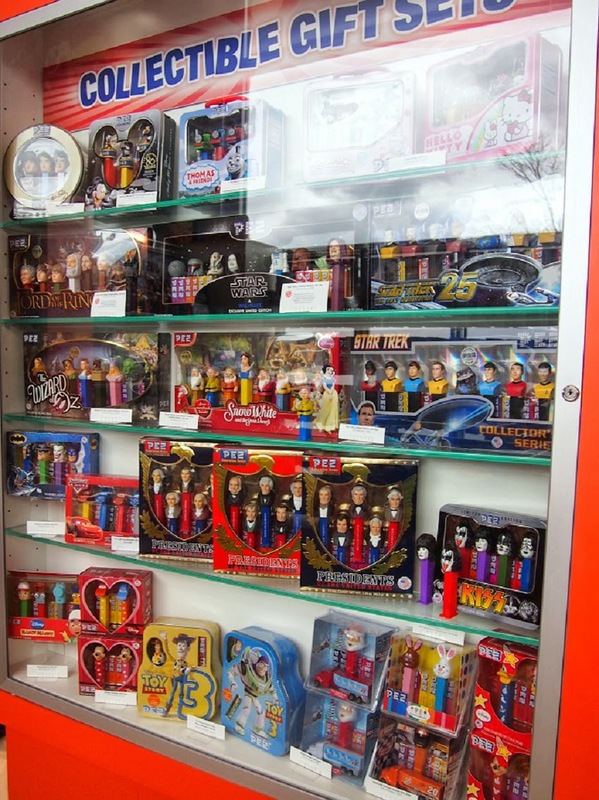 Naturally, there’s also a lot of stuff to buy too. 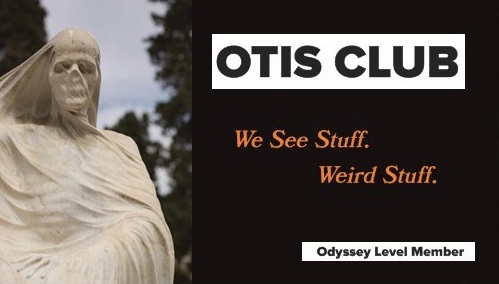 It’s about 45% gift shop. 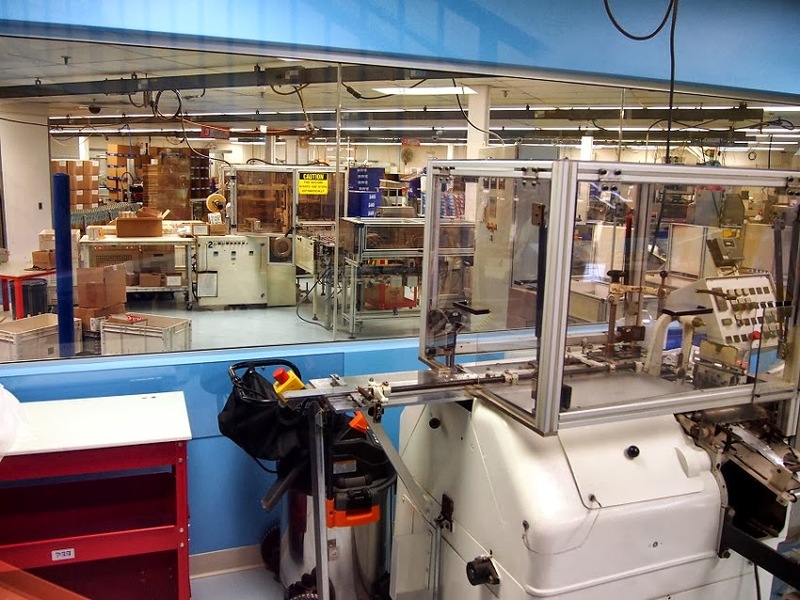 Probably the most interesting thing, I guess, I’m not sure, my ability to measure everybody else’s interest is pretty broken these days, was that you could see through a bay of windows right into the production center, which was full of shiny metal machines and bins of colorful dispensers. We were there on a weekend so nobody was working, but if you drop by during the week, you can see what type of people get to handle PEZ all day and wonder how they top that in their personal lives. I also made me wonder exactly how hard it would be to change careers at my age. Then something broke my reverie. Back in the corner, they had a PEZ…well, ordinarily I’d call it a dispenser, but that’s kind of a taken term in this case. 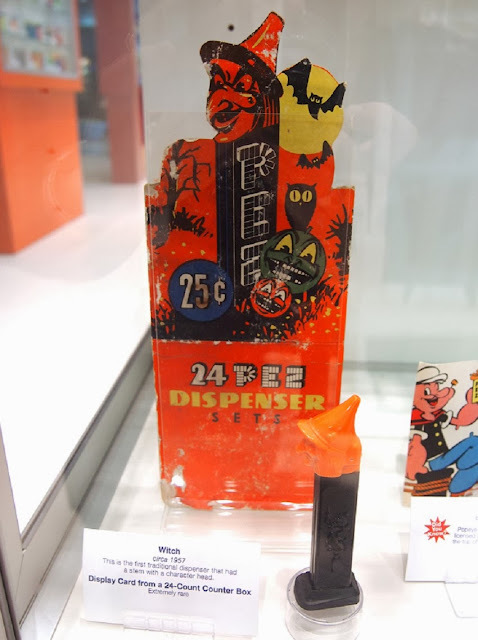 It was a vending machine that poured unwrapped PEZ pieces in whatever flavors you wanted into a big plastic, sealable bucket. It was basically the trough idea I wanted. Glory be to God. Anyway, I don’t think I need to make too much of a connection between candy and the Halloween season, but PEZ is also known for its holiday dispensers, and it releases new ones every year. 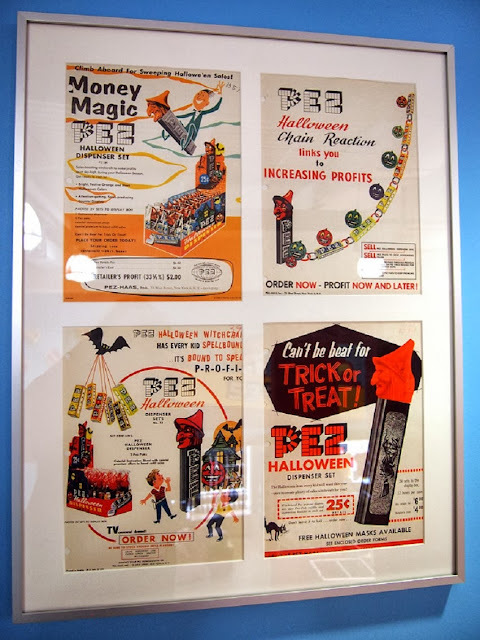 They had a few on display, included the second Halloween PEZ dispenser ever made, a witch from 1957 (the first Halloween PEZ dispenser was witch-themed, but didn’t have a head and was released a year earlier), as well as some old advertisements for it aimed at getting stores to carry it. Of course, these days, that’s not a problem as PEZ is in pretty much every store regardless of what they carry. There always seems to be a few hanging around my house somehow, sticking up between couch cushions or kicked into a corner that we rarely sweep. 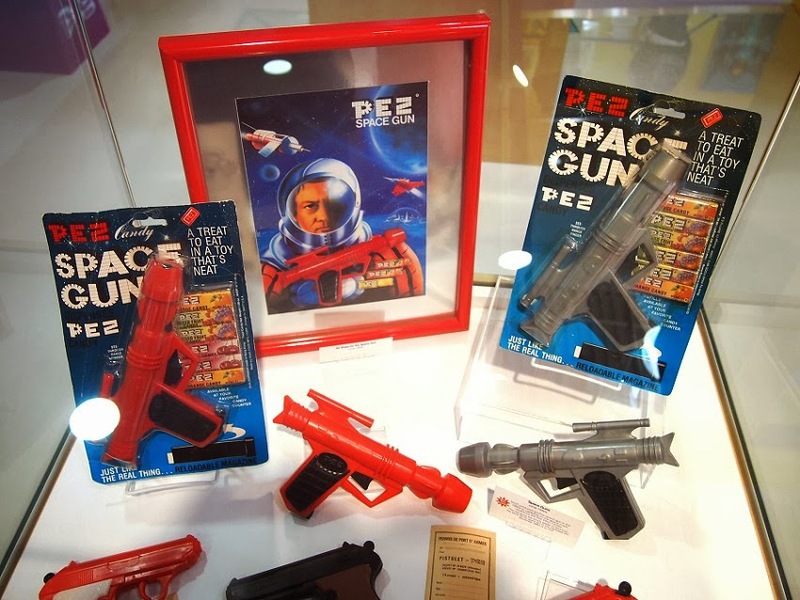 The one PEZ dispenser that gets a place of honor on a shelf in my study is the unopened one I bought at the PEZ visitor center. And it’s a Halloween one. Maybe I’ll throw it in some random kid’s trick-or-treat sack this year. Just kidding. I'm not that nice. I just needed a passable closing statement for this post.